The Civic has been a mainstay of Honda's line-up for many years but, save for a few high performance variants, it's always been perceived as a sensible car. With this model Honda is aims to convince sceptical buyers otherwise. Looking like no other Honda – or any other car for that matter – this Civic is a radical departure for the normally conservative manufacturer. Safe, dependable, reliable. Three words you would normally use to describe a product from Japanese car maker Honda. For all the times one of its cars has performed faultlessly, there are as many critics prepared to castigate the company for producing safe, dependable and reliable cars. In its defence, Honda could never win whichever route it took. 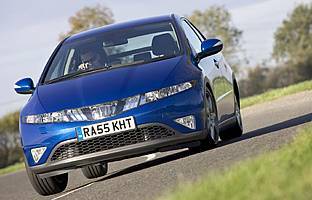 Recent years have seen the Civic become a little more willing in its demeanour, with the gap between it and Toyota's Corolla – universally accepted to be the least sporting of the Far Eastern hatchbacks – widening. While the 2006 model year Civic has moved even closer to its European rivals in terms of handling and ride, it's the looks that will have critics scratching their heads. Unlike any Civic – or Honda – that's gone before, this Civic is proof that the company is serious about attracting younger buyers in a bid to move away from the 'Tartan rug' set. There's no escaping the fact Honda's core buyer demographic is on the mature side. However, the family hatch market is a fierce one and the need to broaden the Civic's appeal is important for company's future. And it's difficult to deny the fact that swooping curves, a rakish nose, Alfa-style rear door handles, a Start Trek-like dashboard and digital instruments will appeal more to the PlayStation generation than any other. Make no mistake, this Civic is a considerable departure from the norm for the usually conservative Honda. But with good reason – in order to attract younger buyers and early adopters it had little choice but to go for a more leftfield approach. Overall the concept works – both inside and out – although be prepared for the stares as you drive around town. Thankfully some things never change, as build quality and driving dynamics are as you'd expect from Honda. On paper the Civic appears to be good value. Standard equipment levels are high and the amount of safety kit is generous even on entry-level models. The cash premium for a diesel variant is high, so make sure you can do the miles to make the extra investment pay off. Other running costs are unlikely to break the bank – Hondas are noted for their reliability, making visits to the dealership rare. A true five-door hatch, the Civic will easily accommodate a growing family thanks to a well-designed and spacious cabin and boot. Although the car's door bins are a little small, oddment space is otherwise reasonable thanks in part to a generously proportioned centre console and glove box. The same is true of the boot, which is both deep and wide and boasts a clever hidden compartment where you'd normally find the spare wheel. Folding flat the rear seats is a convenient one-handed job, and even the seat cushions can be folded up out of the way if required. It's fair to say the Civic's fascia is certainly different. If you're a fan of digital instruments you'll warm to it instantly. For everyone else it's an acquired taste. The set-up does work and, from an ergonomic angle, it makes a lot of sense to group the various dials and controls together and within reach of the driver. However, the front seat passenger will have to stretch to reach the ventilation controls. Also annoying is the inclusion of a starter button – it's really a gimmick. At least the manual gearshift is slick and the handbrake requires little effort to operate. Up front, occupants benefit from decent levels of head and legroom. The Civic's centre console doesn't intrude, affording two adults reasonable levels of elbowroom. 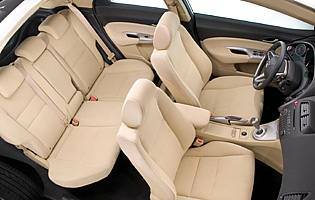 Rear seat passengers are treated in a similar manner, with no major comfort niggles to report. At urban speeds the cabin does well to insulate occupants from road and engine noise, although spirited driving and motorway speeds is not as good. 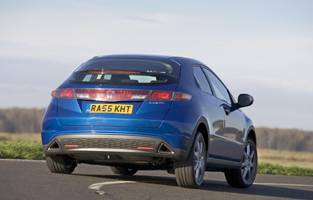 Curiously, it's the diesel that outperforms the noisier 1.8 petrol engine. On a positive note, the Civic does boast a pleasingly supple ride. It might 'only' be a family car, but the Civic is not short of security features. A rolling code immobiliser, deadlocks, remote central locking and a lockable glove box are standard across the range along with a lockable glove box. ES and EX specification cars gain a Category One alarm. Twin front and side airbags come standard on the Civic range, along with anti lock brakes, electronic stability control and brake assist. Isofix child seat mounting points are also present, along with five, three-point seat belts. EX and Sport variants gain headlamp washers. All in all, this little lot is more than what you'll find on some of the Civic's European rivals. All Civics through the years have been fun to drive, but thankfully not at the expense of ride comfort or overall refinement. This variant is no different, although keen drivers will probably bemoan the car's over assisted steering. What makes this Civic special is its 2.2-litre diesel engine. On paper it appears only average, but on the road it pulls strongly from low revs, is quiet once warmed up and offers genuine hot hatch levels of overtaking potential. The manual gearshift is precise and the brakes powerful but easy to modulate. If a compact people carrier doesn't appeal, the Civic would make a reasonable alternative. Granted the car's seating arrangement is fixed – save for the ability to quickly raise or lower the rear chairs – but cabin space is good and the boot is equally generous. Isofix child seat anchor points are present, as are the requisite number of airbags. If bought as the only car in the family, the Civic is presentable enough to be used for business related chores during the week. There's no question that the Civic is easy to drive, making it a sensible option for the novice driver. It's also affordable in comparison with rivals, and is unlikely to cost much to run over a period of ownership. As an aside, the entry level 1.4 petrol variant would be ideal for first timers, as the larger 1.8 petrol and 2.2 diesel are no slouches and would probably cost a bit more to run and insure. On the quality front this Civic is yet another top notch product from Honda. Panels gaps are tiny, fit and finish is exemplary and the choice of materials used to trim the cabin well above the class average. If the performance of past Civics is anything to go by, mechanical reliability should also be first rate. 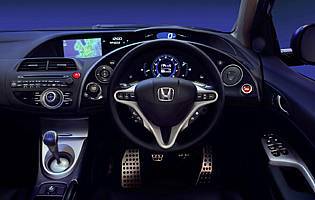 This car's radical exterior is a mechanism for Honda to chase a younger audience, as the firm existing image is one that attracts the more mature buyer. The combination of a slightly elevated front seat position, doors that open wide plus reasonable headroom both fore and aft all make this Civic an easy car to live with. Access to the rear seats is also good, although it's easier to get in than get out. There are no real complaints about the car's boot. The tailgate opens nice and wide and requires little effort to do so. Folding the rear seats to increase the overall load space is a one handed operation. Standard fit is a combined radio and single CD unit, with remote audio controls conveniently located on the steering wheel on SE models upwards. This is a good thing because the unit's own buttons are on the small side. At least the display is on the large size. Sound quality is good from the standard unit, while notable options include a Bluetooth hands free system for your mobile phone and a DVD-based sat-nav unit. The latter is impressive, and comes with a big screen, a rotary controller for inputting commands (it also controls the stereo and ventilation) and an easy to use voice recognition function. Dark exterior colours mask the car's various styling cues, while lighter hues do the opposite so chose carefully. Also worthy of note, the car's head and tail lamps are full width items; the lights are connected by a full width strip of similarly coloured plastic, adding an extra unusual feature to the Civic's exterior. The cabin is a cross between an Audi and a space ship. The former relates to the generous use of high quality black plastic, while the latter refers to the car's distinctly space-age fascia. The standard cloth seats are nice, although the optional leather chairs add a more premium feel. Forward visibility is good, thanks in part to a slightly raised driving position and light steering. Rearward vision is the car's Achilles heel, however. It might look good from the outside, but from the inside the rear window's lack of a wiper and racy spoiler won't help matters in the wet and dry respectively. Thankfully the car's side mirrors are a generous size, and go some way to compensating for the restricted rear view. Petrol engines: 1.4 i-DSI (89bhp); 1.8 i-VTEC (128bhp). Diesel engine: 2.2 i-CDTi (140bhp). Standard issue is a six-speed manual gearbox across the range. Optional on petrol variants (not 1.4 S) is a six-speed i-SHIFT semi auto gearbox complete with steering wheel paddles. Trim levels: S, SE, Sport, ES and EX.